If there's anything more personal than a camera bag, it must be a camera strap. We do use a camera strap when we don't carry a bag but mostly we carry our camera (and a few other things) in a bag. We use nothing more than a wrist strap to secure the camera. When we do attach a shoulder strap, we like to remove the wrist strap because it swings as we walk, banging into the LCD or lens, and gets in the way of the shot when we are aiming the camera toward the ground. They're all a little different and while you mostly ignore them, sometimes you have to think about how to get in and out of them quickly. Various solutions have different issues. Here's what we've used. People used to stop us in the street to ask where we got our Nikon wrist strap. From Nikon, of course. For something north of $30. The trouble was it was only available intermittently. Very frustrating. Nikon. Our least favorite for getting on and off. It was a nice leather pad that rode on a strap that attached to one eyelet like any strap and had a bolt that screwed into the tripod socket. That made it a chore to remove. One day we removed it and just left it off. 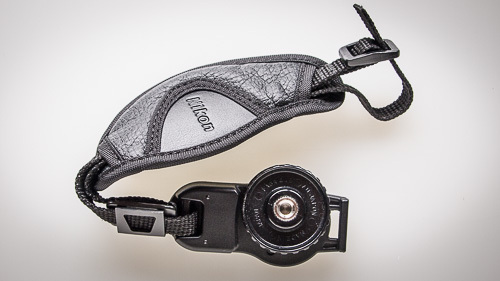 For years, we've had a $10 UPstrap wrist strap attached to our Nikon D300. We made one small modification to it. UPstrap. Needed one little modification, then worked for years. 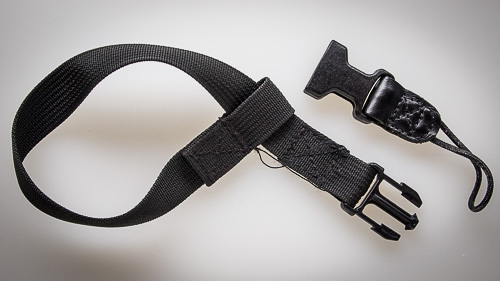 We don't like straps that choke your wrist because you really just need a loop large enough from your closed hand to slip through without assistance. That means keeping the loop open instead of tight on your wrist. 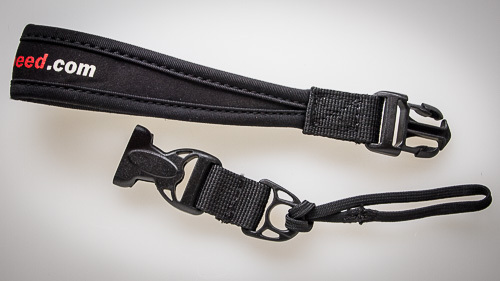 To do that with the UPstrap, we just took a little black thread and looped it through the sliding loop of the strap and the fixed loop on the buckle. Over the years we've had to replace the thread maybe twice. 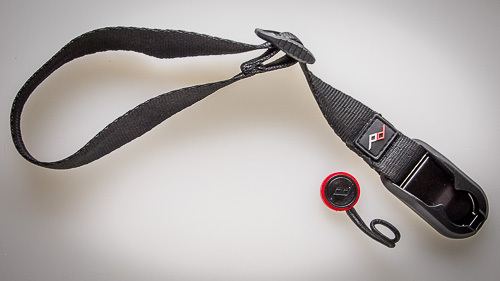 The UPstrap buckle allows you to easily remove the strap from the camera. And it's so light, you don't know it's there. Which is why it's been on the D300 so long. If you have just one camera to carry, this is a very good solution. The Carryspeed site says its products are not for sale in the U.S. so we won't spend much time on the wrist strap. It is a nice padded loop which we found very comfortable to wear with our Micro Four Thirds camera. Carryspeed. Nice padded strap but buckle is too long. It too has a buckle to make removable a snap. But the buckle is attached to a very short strap that attaches to another buckle to which a length of fabric is attached. You loop that fabric through your eyelet and you're ready to go. But that makes the attachment system too long. It flaps against the camera when we remove the loop and use a shoulder strap. Not big problems. But potential for improvement. And we just made that improvement. We solved this issue for all our cameras at once with the $19.95 Peak Design Cuff. Peak Design. Best connector of the bunch. Like the other wrist straps, it's removable. And the generous loop doesn't choke your wrist unless you insist. Some people feel safer that way but we don't want to use two hands to get in or out of the strap. Where the Cuff beats the other solutions, though, is with its buckle. It's very short and unique, making it a snap to switch bodies without removing the strap from your wrist. 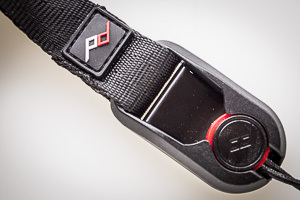 Peak Design invented the Anchor Link Quick Connection System, which we discussed in our review of the company's straps and a clutch that resembles the Nikon strap. An Anchor Links is nothing more than a small but thick plastic disc that slips into a spring loaded buckle, snapping into place securely. The disc attaches to an eyelet with a short cord. Two links come with the Cuff. We had some extra ones laying around from an earlier review, so we put a link on all four of our cameras. Since we only shoot with one camera at a time, we only have to pop off the strap and attach it to whatever we're using at the moment. The link is small enough you almost don't know it's there when you remove the strap. It stays out of the way. It doesn't flop against the camera or the lens. In fact, it can't reach the lens to get in the picture. The strap isn't padded but if you're ambitious with a sewing machine, you can replace it with a padded one. It's funny how much work can go into something as simple as a wrist strap. The Nikon that generated so much admiration worked fine but took more effort to take on and off than we liked. The UPstrap works well with a little modification. The Carryspeed isn't available but has too long a connector anyway. But by virtue of its unique link, the Peak Design Cuff addresses all the shortcomings of the other designs. That earns it all four photo corners in our book.